A documentary about vitamins: the history of their discovery, the dietary supplement industry, and the dangers of both deficiencies and excessive intake. 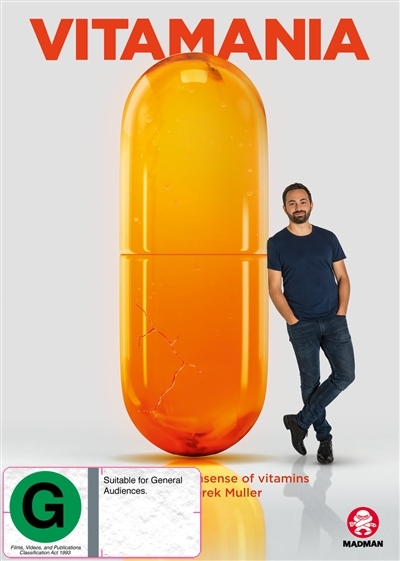 Almost one billion of us take a regular dietary supplement, mainly vitamin tablets. Vitamins are enthusiastically endorsed by ... read full description below. A documentary about vitamins: the history of their discovery, the dietary supplement industry, and the dangers of both deficiencies and excessive intake. Almost one billion of us take a regular dietary supplement, mainly vitamin tablets. Vitamins are enthusiastically endorsed by celebrities, and vitamin-fortified foods line our supermarket shelves. But how safe are these products? Is it true that vitamins are natural and therefore can't do you any harm? How are they regulated, and how can parents make the right choices for their children's health. These surprisingly urgent questions are investigated by scientist Dr Derek Muller in Vitamania, the latest documentary made by Emmy Award-winning Australian filmmakers, Genepool Productions.